The Robin­son Nature Cen­ter fea­tures inter­ac­tive exhibits on local habi­tats, wildlife and the Chesa­peake Bay. There is also a Children’s Dis­cov­ery Room, an out­door Nature Place explo­ration zone, class­rooms, a mul­ti­pur­pose audi­to­rium and a 50-seat “Nature Sphere” which is a state-of-the-art digital plane­tar­ium that fea­tures plan­e­tar­ium pre­sen­ta­tions and full-dome movies on nature, science, and his­tor­i­cal top­ics. The nature cen­ter build­ing show­cases sus­tain­able tech­niques and mate­ri­als. The nature cen­ter received LEED Plat­inum Cer­ti­fi­ca­tion, an internationally-recognized dis­tinc­tion that a build­ing is envi­ron­men­tally respon­si­ble. 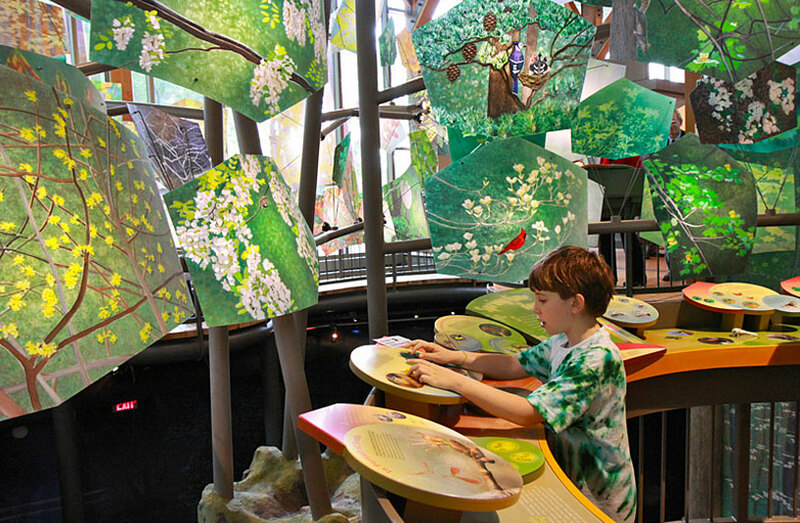 The nature center’s “green” fea­tures include per­vi­ous paving, a green roof, geot­her­mal heat­ing and cool­ing, water con­ser­va­tion, energy effi­ciency, nat­ural light, and sit­ing the build­ing to min­i­mize impact. The build­ing mate­ri­als them­selves were as green as pos­si­ble by including local sourc­ing, FSC-certified wood, recy­cled con­tent, reclaimed wood and stone, sustainably-grown mate­ri­als, and low-emitting materials. Please visit the Robin­son Nature Cen­ter web­site for more details, admis­sion and hours infor­ma­tion, programs and vol­un­teer opportunities.